The University of Hawaiʻi at Hilo recognizes its responsibility to provide for a learning environment most conducive to the educational development of its students and employees. Being a member of the University community provides both rights and responsibilities. It is the responsibility of all UH Hilo students and employees to be knowledgeable of, and abide by the following policy relating to alcohol and drugs. 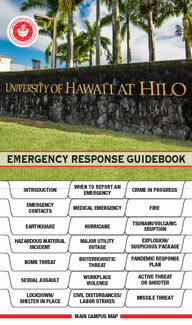 UH Hilo students and employees are expected to comply with all federal, state and University rules and regulations. Expressly prohibited is the manufacture, use, sale, purchase, distribution, or possession of dangerous drugs and narcotics as those terms are used in state and federal law, at University sponsored or approved events or on University property or in building used by the University for education, research, or recreational purposes. This includes marijuana, cocaine, heroin, morphine, LSD and other hallucinogens, as well as barbiturates and amphetamines. The University will cooperate with law enforcement agencies responsible for enforcing laws related to use of illegal drugs or alcohol. The Drug-Free workplace Act of 1988 (Public Law 100-690, Title V, Subtitle D) requires that University employees directly engaged in the performance of work on a Federal contract or grant shall abide by this policy as a condition of employment and shall notify the University within five days if they are convicted of any criminal drug statute violation occurring in the workplace or while on University business. The University is required to notify the Federal contracting or granting agency within ten days of receiving notice of such conviction and to take appropriate corrective action or to require the employee to participate satisfactorily in an approved drug-abuse assistance or rehabilitation program. The purchase or possession of alcoholic beverages is regulated by Hawaiʻi statutes. Under state law, no one under the age of twenty-one may purchase or be in possession of alcoholic beverages in any public place. At UH Hilo, consumption of alcoholic beverages is permitted in student residence hall rooms and student apartments by students twenty-one years of age or older, with the exception of Hale Kauanoe which is designated alcohol free. Consumption of alcoholic beverages is forbidden in all public and common areas of the residence halls. Students who violate state law and/or University policies are subject to campus disciplinary sanctions including suspension and revocation of housing. Students are also subject to disciplinary action should their alcohol consumption lead to disturbances or endangerment of others. All other service or consumption of alcoholic beverages on University property requires a special permit by the Dean of Student Services or Vice Chancellor for Administrative Affairs. All required alcoholic use permits must be obtained at least two weeks prior to the event. Effective measures for monitoring alcoholic consumption regarding legal age, level of intoxication, and appointment of designated drivers will be taken. Non-alcoholic beverages must be available in sufficient quantities and displayed as prominently as alcoholic beverages. If alcoholic beverages are served, food items should also be available. Service of alcoholic beverages must be discontinued at a reasonable time, suggested to be at least one hour prior to the scheduled end of the event. Potentially dangerous drinking activities (e.g., “chugging” or competitive drinking events) are expressly prohibited. Students found in violation of alcohol or drug policies are subject to disciplinary action as provided for in the UH Hilo Student Conduct Code. Sanctions may range from mandatory involvement in educational sessions to suspension and expulsion. Organizations found in violation are subject to revocation of charter and loss of university privileges. Employees of the university found in violation are subject to disciplinary action as provided for in university policy and collective bargaining agreements. Criminal cases will be forwarded to the appropriate law enforcement agency for investigation and prosecution. As part of its commitment to an alcohol and other drug free environment, the University shall provide educational programs that will include informational and preventative components (e.g., peer counseling activities, workshops, demonstrations, printed material). The University recognizes that alcohol and drug dependencies are treatable conditions. Employees and students with a substance abuse problem are encouraged to obtain help immediately. Employee health insurance plans often defray part of the cost of rehabilitation programs. UH Hilo will support employees by granting the use of sick leave for participation in such programs. Students who feel in need of assistance are encouraged to see a counselor in the Student Services Building. Any assistance provided will be strictly confidential. A listing of community agencies providing alcohol and drug treatment services is also available from the Counseling Center.